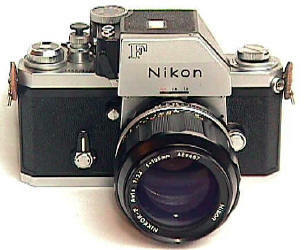 The Nikon F appeared in 1959, followed by the Nikon F2 in 1970. They are generally considered the most reliable of all mechanical 35 SLRs. The F2 is an improved F. Together they are the ONLY professional quality Mechanical shuttered Nikon cameras. Unlike the later F3/F4/F5 and most of today's electronic wonders, the F and F2 shutters work even with dead batteries. Unlike today's F3/F4/F5, the F and F2 will still be working a hundred years from now----long after the electronic camera's electronic parts are unavailable!! All Pro Quality Nikon F series cameras have BOTH interchangeable finders and focusing screens. This flexibility allows you to match the viewing and focusing to the job and lens at hand. Changing to the right finder or screen for a particular job and lens combination can make things a lot easier. Very few SLRs offer such versatility. For example, as excellent as Canon EOS cameras are, NONE offer the versatility of interchangeable finders. Nikon F and F2 Focusing Screens are totally interchangeable (YEA!). Nikon F Finders: Most were available in either Black or Chrome. All F meter heads, AKA Photomic heads, were designed for the original style NAI lenses. To remove F finders, depress the finder release button on the back of the body near the rewind lever with a closed BIC pen or equivalent. Nikon F's (and F2's) are designated by their finders. You might see advertised "Nikon F w/o finder" indicating just the body, or "Nikon F w/Prism." IF you have a F body with the T Photomic, it is a Nikon Photomic T. IF you have a Nikon F body with a FTn Photomic, it is a Nikon FTn Photomic, and so on. Please note that the prism was produced side by side with all the various meters. Customers could order their new Nikon F or F2 with either the standard meterless prism, or their choice of the newest meter available at that point in time. NOTE Backward Compatibility. The F Photomic finders will also meter just fine with the later AI/AIS lenses, since these lenses also have the NAI metering prong. AF Nikkors will even work properly with the F Photomics if you have the prong added. If not, you can STILL use stop down metering! No other SLR maker has such extensive metering and lens compatibility. Eat your shutters out, Canon and Leica! Prism Finder This was the F's original eye level finder, when there were no other eye level options in 1959. Available in both chrome and black, they went through several versions. The last version takes screw in diopters or the right angle finder. The F prism is relatively small and has no built in meter. 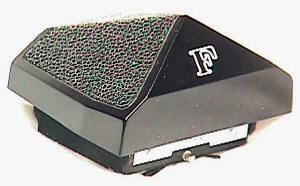 As F Photomic finders bite the dust due to lack of parts, the F prism became the most popular F finder to both collectors and users. Translation: climbing prices. NOTE: F and F2 Prisms have NO metering capability, so it makes no difference what kind of metering coupling your lens has! Late F prisms are threaded for screw in diopters or a right angle finder, earlier prisms are not. Model 1 Exposure Meter recognized by rounded front corner near ASA dial, will take a meter booster for low light. This was introduced with the camera from the start in 1959. Model 3 Exposure Meter recognized by square front corner near ASA dial, will take a meter booster. 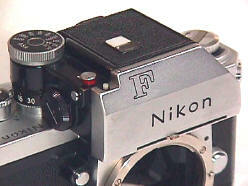 The Nikon F's "flag" Photomic meter head of 1962 introduced the F's first built in meter at about F # 6450000. 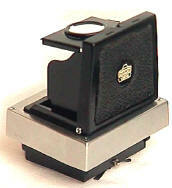 Replacing the standard prism, the Photomic ingeniously included the prism and meter in one unit. The Photomic idea continued through various new and improved models through out the Nikon F and F2 lines. Though rather bulky and heavy, the Photomic introduced a crucial concept to the Nikon system: NON-OBSOLESCENCE. By placing the meter in the prism head assembly, Nikon was ingeniously able to update its metering system as time went on without obsolescing the body. All a customer had to do was take off the old metering system, and put on the new one. A great idea which continued with the Nikon F2, only to unfortunately die with the advent of electronic shutters and the F3. The 60's were a time of camera manufacturers scrambling all over themselves trying to figure out the best way to design those new fangled TTL metering systems. For instance, it took Pentax years to realize that stop down metering was NOT the way to go. Ironically, the camera that introduced TTL metering had it ALL right the first time: the Topcon Super D. Specifically Topcon used open aperture metering and automatic coupling between the lenses and camera bodies from Day One. Unfortunately, it took quite a while for most of the other manufacturers, including Nikon, to equal the Topcon's initial great design in terms of convenience. To be exact, Nikon couldn't equal the Topcon's convenience until the introduction of the AI lens system in 1977 -- only 14 years AFTER Topcon!! The Original Photomic had no TTL metering! You can recognize it by the metering "EYE" on the top left of the metering head (as you are looking at it) and by the "FLAG" which was the meter's on/off switch. Flag down for off, flag up for on. The Flag sits just behind the front of the "EYE." There are at least three versions of the original Photomics. The first flag Photomic's battery cover did NOT have outside threads to store the telephoto attachment and incident attachment. The second type (shown here) had a batter cover which was threaded, to allow the incident and telephoto attachment to be stored piggy back. The flag was later replaced by a less patriotic a push button switch, creating at least three versions of the original Photomics -- besides black and chrome versions. The flag is shown in up position here, though you will have to look carefully since it is black against a black background. The screw in tube narrows down meter sensitivity. Notice the white cover on the side of the meter. That's the incident light meter attachment, which could be used by attaching over the CDS cell. Both the tube and the incident light cover could be stored together by screwing them into the threaded battery cap. It's worth noting the original F Photomic incident attachment is the ONLY time Nikon offered incident metering on their cameras! IMPORTANT: ALL SELENIUM METERS AND ORIGINAL PHOTOMIC FINDERS FIT ALL NIKON F BODIES. This is often confused. The original Photomics did not need F body modification! The reception angle could be changed from 18 degrees to 70 degrees by attaching the angle converter tube, which stored conveniently on the side of the finder. F stop settings were visible from the back of the finder, just above the eyepiece. Meter settings were visible in a separate meter window on top of the finder, useful for copy work when mounted on a copy stand. 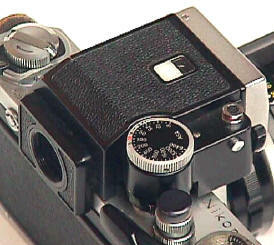 This feature was used on all later metering heads for the F and F2. The flag was the off switch. Amazingly, the original Photomic also had an INCIDENT meter reading attachment which also stored on the meter itself. Its a little white opaque disk which screws into the battery compartment cover for storage. The angle acceptance converter screws in right on top of it for storage. Take it off and screw it into the front CDS cell and PRESTO, you have an incident light meter!! This is the only time Nikon made such an attachment for a built in camera meter! Set ASA dial on shutter dial to match film. You HAVE TO match up the maximum f/stop of the lens in use with the ASA dial on the finder. Forget to do this, and you will have blown the exposure. UGH. A single 625 battery was required. Later F Photomics used two. To remove the Photomic finder, depress the body release button on the back left hand edge of the top plate. 2nd Version Original Photomic, basically the same as above, but with a push button replacing the "flag" to switch the meter from high to low readings. 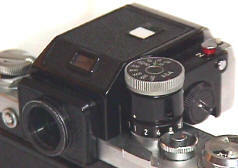 The Photomic T introduced the now standard TTL (Through the Lens) metering in August of 1965 at approximately F # 6585000. This was a big improvement since it greatly improved metering accuracy, and made metering with bellows and microscopes very easy. The T read an "averaging" pattern over the focusing screen. The base of the Photomic T was enlarged, so the F finder bay needed to be enlarged as well to accept the new meter. The "RED DOT" before the serial number on the late F 65 bodies starting about 6585000 and continuing to about 6603500 indicate these bodies can mount the Photomic T. A small ridge which extended about 3/32" above the top plate on either side of the eyepiece canal had to be removed to allow the mounting of the new Photomic finder The could be done by Nikon, or by independents. Poorly done conversions just filed these edges flat, decreasing the value of the camera. Modified F's initially had a RED DOT in front of the serial number, starting about 6585000. F production continued with the RED DOT, but was stopped at about 6603500. Production resumed starting at 6700000 -- WITHOUT the RED DOT. After F # 6700000, all F's left the factory modified to take the Photomic. Unmodified bodies are worth slightly more to collectors, and slightly less to users, since they can't mount the more modern Photomics. So, if you have an early body and you can't mount a Photomic finder on it, the odds are you have an unmodified F body. On the other hand, maybe you're just a klutz. Set ASA on shutter dial to match film. The lens is MOST EASILY removed and attached when set to f/16. Coupling the lens to meter is most easily done by pre-setting both to 5.6. Push down switch on side of meter to turn it on. You HAVE TO match up the maximum f/stop of the lens in use with the ASA dial on the finder. Forget to do this, and you will have blown the exposure. Earlier T's require that you turn the ASA dial for this. Later ones allow you to more easily pull up and rotate the dial. ugh. 1967's Photomic TN introduced Nikon's famous center-weighted metering, a design so successful it is still used in some Nikons to this day.. The TN Photomic can be recognized by a "N" beside the meter switch on the top front, otherwise they look pretty much the same as the previous Photomic T. It lasted only until 1968. Identifying points: "N" near battery check button, no f/stops on front of finder, f/stop window on back of finder above eyepiece. The little white button in front of the on/off switch is the battery check. A centered needle indicates the batteries are OK fine. 1968's Photomic FTN is the F's best meter. The FTN started at F body # 690000 and continued until the end of F production in 1974. The FTN was the first and last F Photomic to have shutter speeds visible in finder. 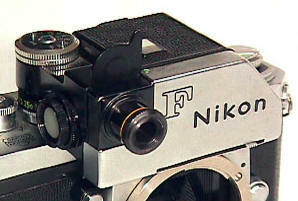 More securely attached to the camera body than its predecessors, the FTN used a new front latch over the nameplate. It was released by a black plastic tipped lever on the finder's left side. FTN Identifying points: F/stop markings on front of finder and shutter speeds visible in the finder. Meter coupling greatly improved with the FTN. All you have to do is mount the lens and then turn the aperture ring from one extreme to the other. This action automatically couples the lens to the meter. If you forget to do this, you will end up with the wrong exposures! Left: White window on top of meter illuminates the shutter speeds in finder. In front of it is the meter needle for waist level operation. The large ring is the ASA dial, rotating on the shutter dial. Lift it to set the desired ASA. The small off/on switch and battery test buttons are forward of the ASA dial. In front of that, you can see the edge of the meter release lever. Push in on it to release the front of the finder. The other FTN release is that small round button to the left of the eye piece, designed for uncomfortable thumbnail operation. To replace batteries, remove the FTN to reveal a bottom mounted battery compartment. Right: An Apollo FTN mounting one of the sharpest lenses of all time: the 105/2.5 Nikkor. The FTN finder needed another small modification to the F body. Nameplates before 690000 have square edges, after that point the edges are slanted to allow mounting of the FTN finder. All it takes is two screws to change the finder plates. The FTn was a MAJOR improvement because it allowed you to quickly couple the lens to the meter. To key the meter to the lens via the prong on the lens, turn the lens aperture ring from one extreme to the other. IF set properly, the maximum F stop of the lens you are using will be indicated on the front of the finder. For the first time shutter speeds were visible in the finder for the F (but not F stops). F bodies starting at serial # 6900001 left the factory with the slightly modified nameplate to allow mounting of the FTN finder. The on switch is at the top left front as the meter faces you. The FTN takes two 625 batteries in a battery compartment located at the bottom front of the finder. To change batteries, the head must be removed. The FTn has a battery check. Push the on/off switch down and hold it down. If the needle moves to any portion of the center circle, the batteries are OK. Otherwise, replace them. Meter exposure range EV 1-17 with ASA 100 film. So what does this add up to? EIGHT Nikon F Meters and THREE different F body variations. All Nikon F Photomics were designed for the now outlawed in the US 625 1.3 volt mercury batteries. Of course, these batteries are still legal in many other countries. Until very recently I had to tell people there was probably no fix for their dead or dying Photomic meter. Recently, however, I have found a repairman who specializes in fixing them. See my Repair section for details. This reality has had an unusual side effect. With the big Photomic meters slowly dying, the smaller non metered prism has gained a new popularity for both the user and the collector, resulting in much higher prices than before. The best solution? F2 Photomics will fit the F if you remove the nameplate. So, then you have a much improved meter atop your F, but what about the batteries? The F had them built into the Photomic, the F2 has them built into the body. I hope some enterprising repairman invents an easy way to affix batteries on the side of the F2 Photomic -- to make the newest F Photomic. Action Finder Nikon invented this type of finder so far as I have been able to determine. Besides the F, it was also made for the F2/F3/F4/F5. The Canon F1 series also had their own version. It is a large finder, with a eyepiece measuring about 1 1/8" by 1 1/4"---or larger than the actual film size. It has a very long eye relief which allows viewing and focusing up to a foot or more from the finder. The action finder is very useful for fast moving sports events, as well as slide copying. Waist Level Finder This finder allows low level or waist level viewing and focusing. Its very useful for low angle shots (i.e. from the floor), slide or document copying. Its also very useful at the back of crowds. Turn the camera upside down and hold it above your head. You will be able to view on the waist level finder. There are at least four variations of the finder, the last if by FAR the best for the user. To the left is the "3 sided" finder, made in at least two variations. The first one has the Nippon Kogaku logo. The hood only has three sides, leaving the back edge open to stray light. The last "four sided" version to the right, is practically the same in construction as the F2 waist level finder. Not only is it much easier to use, it also does a better job since all four sides are shielded from stray light. If you have both F's and F2's, this is your best waist level choice, since it easily fits both cameras without any sort of modification. 6x Waist Level finder for the F, like the F2's DW-2, is very hard to find, but does exist. Stop Down Metering? How can that help me? Well, maybe it can't, but at least it can help take pictures. The various F/F2 meters normally work at FULL APERTURE. That is, they take a reading at the lens' maximum f/stop. This is a great feature which allows the brightest viewing of the subject all the time. Yep, you got it, FULL APERTURE metering "won" and became today's standard. The alternative is STOP DOWN metering: closing down the lens to shooting aperture to take a meter reading. This makes the finder image darker, often much darker. This was necessary in the days when without coupling between the lens and meter, like the Pentax Spotmatic. Yet, STOP DOWN has its specialized uses. Why bother? Because all TTL F/F2 meters offer Stop Down metering. When you need it, you really need it, and then you have it. Revised: November 25, 2003. Copyright � 2002 Stephen Gandy. All rights reserved. This means you may NOT copy and re-use the text or the pictures in ANY other internet or printed publication of ANY kind. Information in this document is subject to change without notice. Other products and companies referred to herein are trademarks or registered trademarks of their respective companies or mark holders.